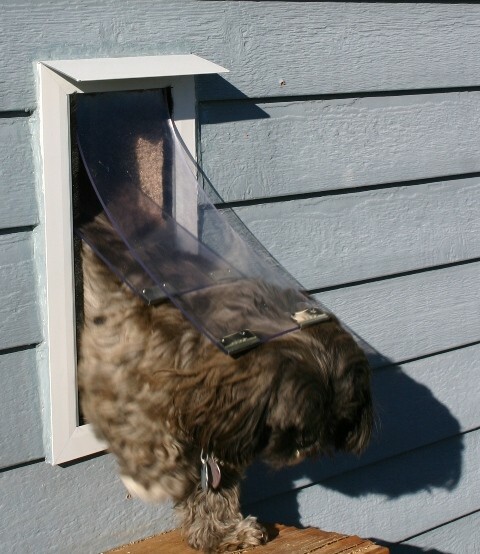 Lacking an acceptable door entry application, using a wall-mounted pet door can provide your pet a good point of entry and exit to and from the home. 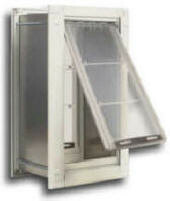 We can mount pet doors specifically designed for use in walls into most wall types. In some cases, a combination of pet doors might be your best option, with one providing access from the home's interior to the garage and another for access outdoors. While it is advisable to use similar pet door types when two are installed, it is fine to use two different brands or types as long as you are willing to teach your pets, with a little patience, to use them. Both manually operated pet doors and electronic, or automatic pet doors can be installed into almost any wall, including siding, dryvit, brick, or stucco. We have a few different electronic models, triggered by coded RFID signals to allow access to only pets wearing matching RFID tags. 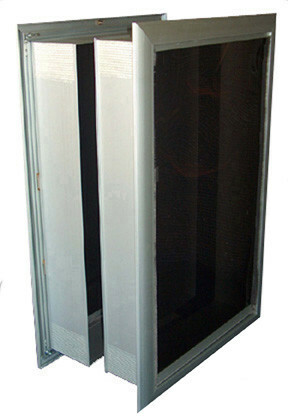 These types of electronic pet doors are much more reliable and accurate than older technology like infrared or magnetic activation. All our manufacturers produce wall-specific manual pet doors in several sizes and styles, but we have electronic models from only PetSafe (SmartDoor) and Plexidor at this time. Look for more electronic models soon. Hale Pet Door offers a variety of unique, patented Security Barriers for their wall units to provide excellent protection against intrusion. Their Cat Guardian barriers are designed to prevent cats or other animals from using the pet door.